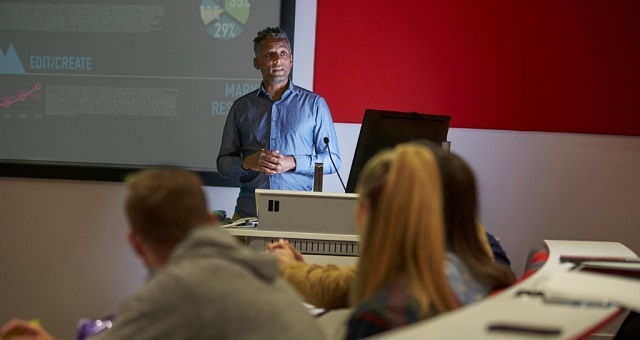 The key to handling disruptive students is to make expectations clear at the outset of the course, says William Jennings, chair of the Department of Finance, Real Estate, and Insurance at California State University-Northridge. As chair, Jennings serves as a resource for faculty who need to deal with disruptive students, but he does not tell faculty members what sort of classroom culture to create. “We’re a fairly laissez-faire department. We hire good people and want them to make good decisions, but we help them and have discussions [about disruptive students] from time to time,” Jennings says. What to include in a syllabus depends on the individual faculty member. For example, a faculty member who does not tolerate students eating in class should make that clear at the outset of the course rather than having to confront a student who unwittingly violates that professor’s rule. While clearly stated rules can prevent some disruptive behavior, students will occasionally violate codes of conduct, whether it’s because they feel passionately about a topic in the course or simply because they are concerned about their grades. When a student does something disruptive, it’s best for the instructor to take action immediately. If it’s a minor disruption, the instructor can simply talk to the student during or after class. Whatever action a faculty member takes, the student should be held accountable for his or her behavior. For more serious problems, the faculty member should talk to the department chair about the problem. Ignoring the problem or delaying talking to the chair can make the problem worse, Jennings says. In some cases, it helps for the chair to sit down with the faculty member and student to discuss the incident. “The listening process often helps to defuse the situation. Listening doesn’t mean you have to agree with [either the faculty member or student], just hearing what they have to say and trying to get a sense of what the issue is. If people get the feeling that they’re being heard, that’s really an important part of resolving the conflict,” Jennings says. The chair’s role in this is to create an environment in which faculty members feel comfortable talking about problems that occur in their classrooms. It’s important for the department chair to avoid criticizing a faculty member when a disruption is brought to the chair’s attention. Faculty need to feel that you are someone they can confide in to help handle a problem. “When faculty know it’s really safe to contact the department chair and say, ‘I’m having a problem with a student; let’s go to lunch and talk about it,’ or ‘Can I have five minutes of your time?’ it creates an environment where faculty will talk among themselves and problems will get solved much more effectively,” Jennings says. How can a chair create that safe environment, particularly for nontenured faculty? “Probably through everything you do. When you hire new faculty, before you even bring them in, make sure they know that the department is a collegial, safe place to be,” Jennings says. As chair, you may not have all the answers, but you can connect faculty with people on campus who can help, whether it’s someone from student affairs, counseling services, or, in threatening situations, the campus police. Reprinted from “Dealing with Disruptive Students” in Academic Leader 22.4(2006)7,8 © Magna Publications. All rights reserved.